I always knew Belgium had plenty of hidden gems, and a visit to the waterways and canals reconfirmed that opinion. I recently had the opportunity to see and experience Belgium’s mesmerising waterways with its various boat elevators, inclined planes, and locks. Brussels by Water is an organisation that promotes the navigable waterways of the Brussels region, thereby helping enhance the image of Brussels as a tourist destination. 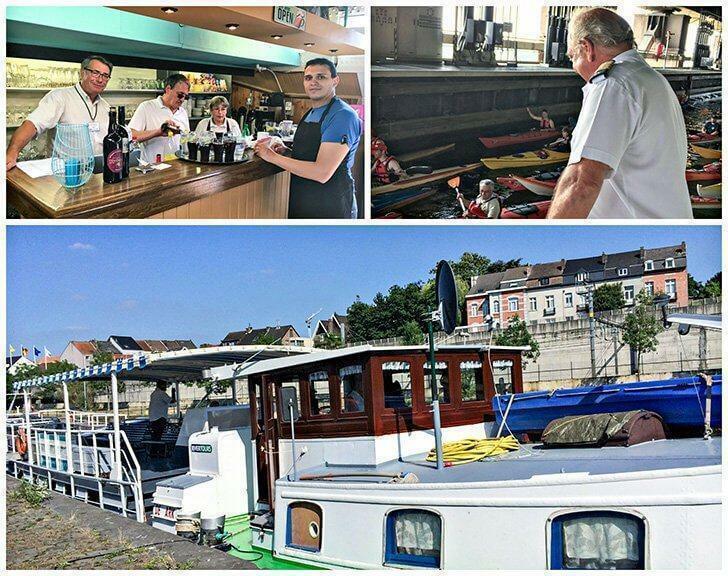 Brussels by Water, with its partner Rivertours, regularly organises tours along the myriad waterways of Belgium. 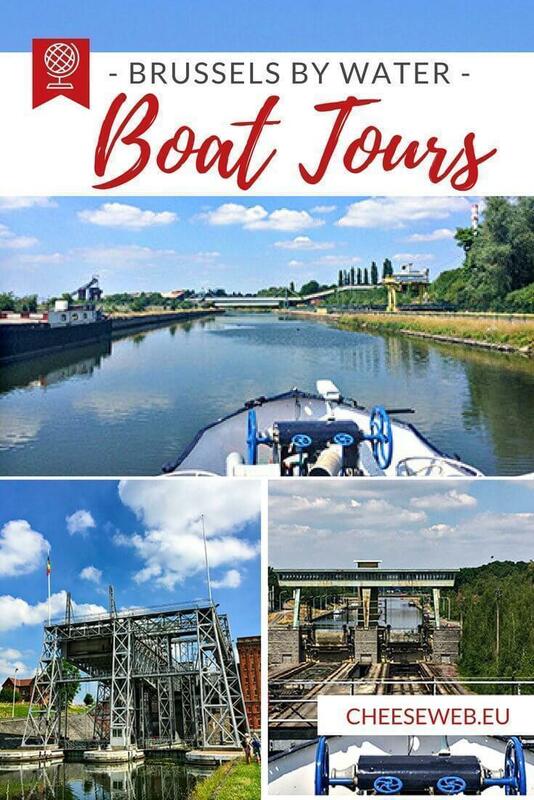 We were invited on a boat tour through the boat elevator of Strépy-Thieu, over the Inclined Plane of Ronquières and through the locks of Ittre and Lembeek. 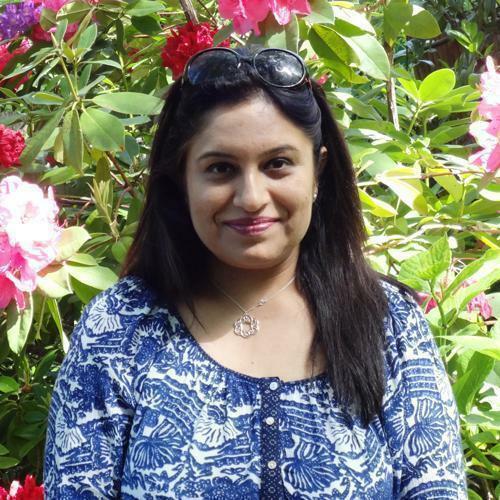 The tour was meticulously planned and well executed, with excellent service aboard the boat. We begin at 9 am, looking forward to an enjoyable day on the water. Our departure point was Suikerkaai, Halle, from where a motor coach took us to the awe-inspiring funicular boat lift of Strépy –Thieu. Our boat was waiting for us, and after hopping aboard, we were taken atop this colossal structure, which took about 20 years to build. 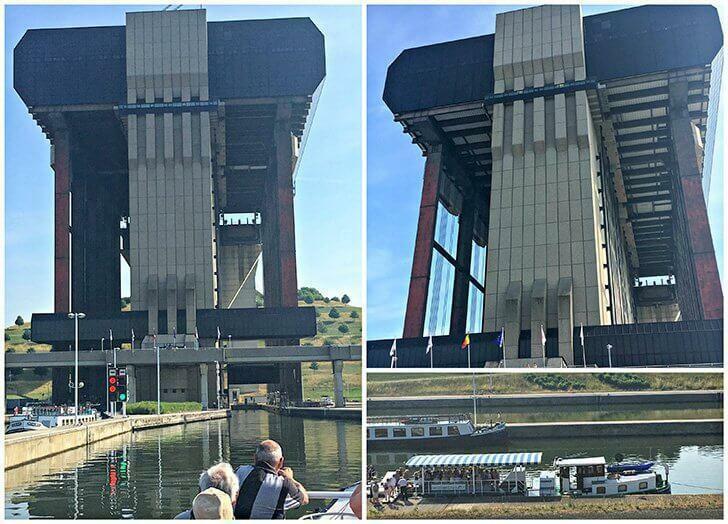 The boat lift connects the Escaut and Meuse basins and allows boats to cross a height difference of 73.15m. 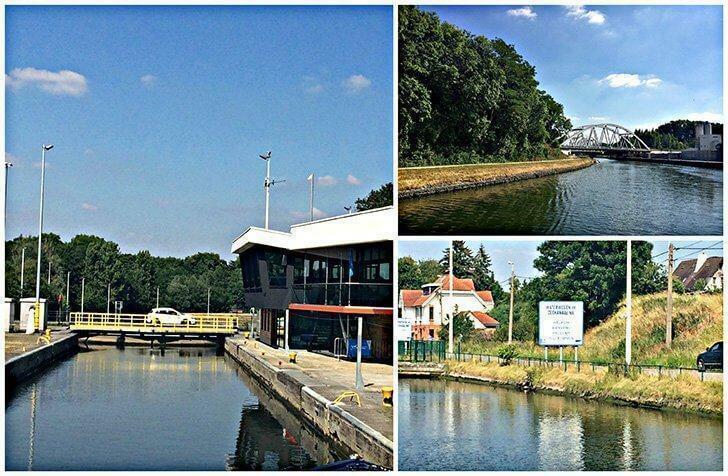 It was an enjoyable experience aboard the boat lift with our fellow passengers and kayakers who were lifted along with us, to the new Canal du Centre. 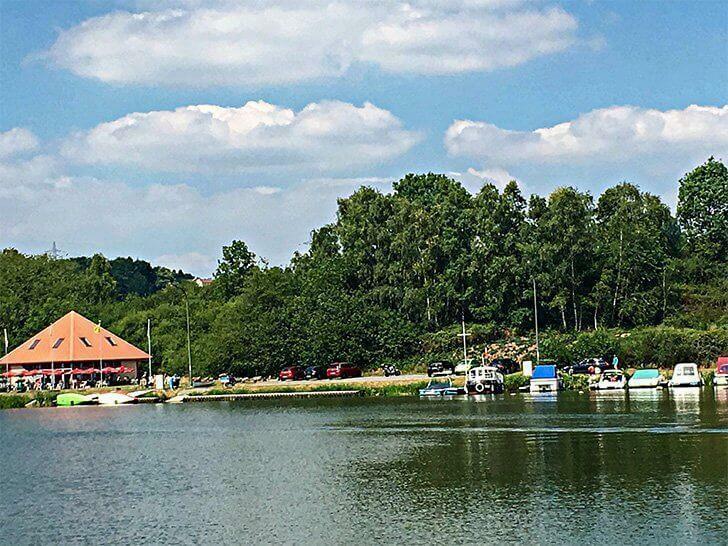 Strépy -Thieu is a marvellous example of Belgian engineering and, apart from the boat tour, can also be visited and experienced with your friends and family for a small admission fee. (Read our full article here.) The staff aboard the boat, especially the captain, kept the atmosphere gung-ho with energy during the ride. We were now on the Canal du Centre, banked by incredible scenery along the waterway. The sun was out, helping us enjoy the tour even more. The service aboard the boat was excellent too with drinks served at your seat throughout the duration of the trip. 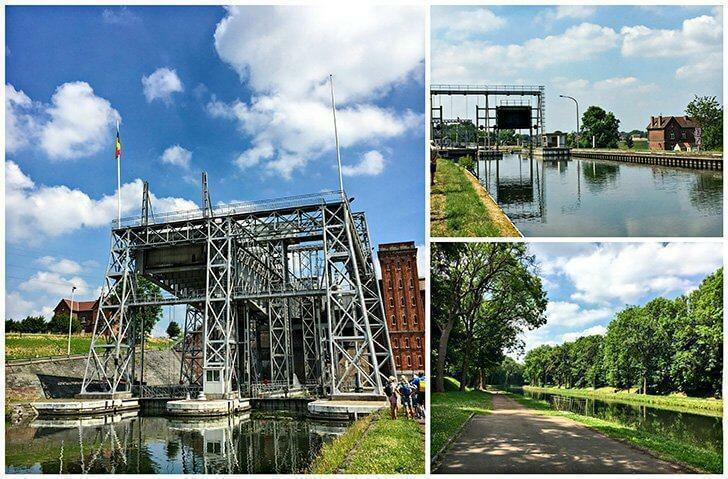 After about an hour, we stopped for a little halt at Houdeng-Goegnies for a walk to the historic boat elevator (a UNESCO World Heritage Site) on the Canal du Centre. Our guide was extremely informative about the historic boat lift and pointed out the engineering differences between the old and new elevators. The entire commentary is both in Dutch and French and makes the tour interesting and educational. We boarded the boat again, and it was almost lunchtime. You need to pre-order food if you want to eat at the small, but cute restaurant onboard. The cold meals consist of both meat and fish options. You can also take your own picnic and order drinks on the boat. I chose a meat and fish option, which was prepackaged by Dassonville Traiteur. The salads were fresh, and the fish and the meat were decent. We continued our voyage on the Brussels-Charleroi Canal and approached the inclined plane of Ronquières. 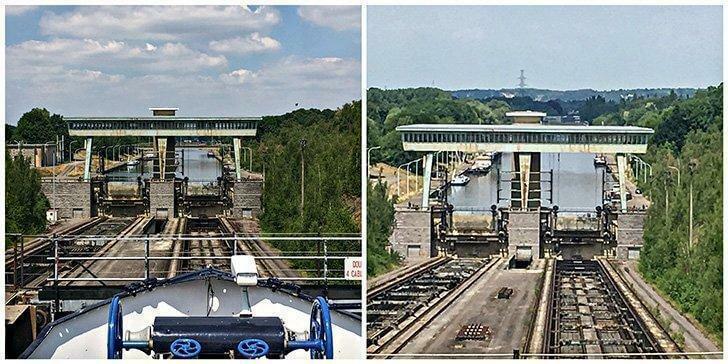 It is located in Hainaut Province, consists of two caissons mounted on rails, and lifts the boat 67.73m. The view of the forested area along the waterway is magnificent. 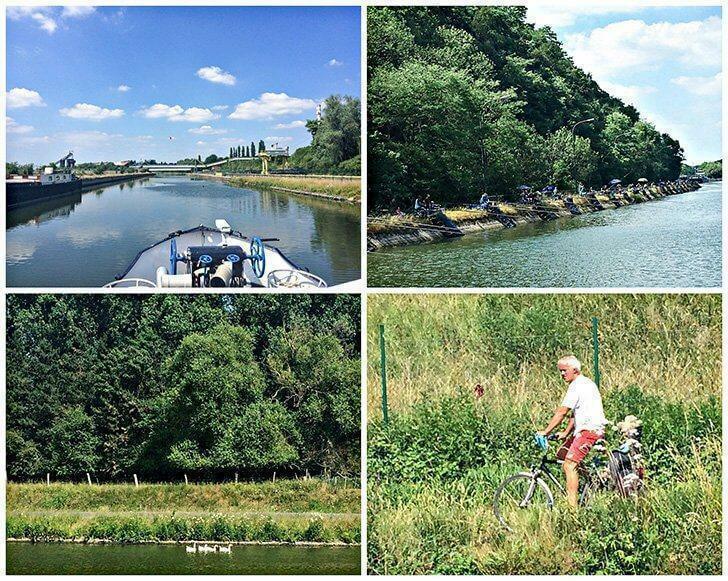 We saw many cyclists and pedestrians, young and old, all enjoying the natural reserves of Ronquières. While we enjoyed the view, the boat continued its tour along the canal, and we reached the canal lock of Ittre in Walloon Brabant. 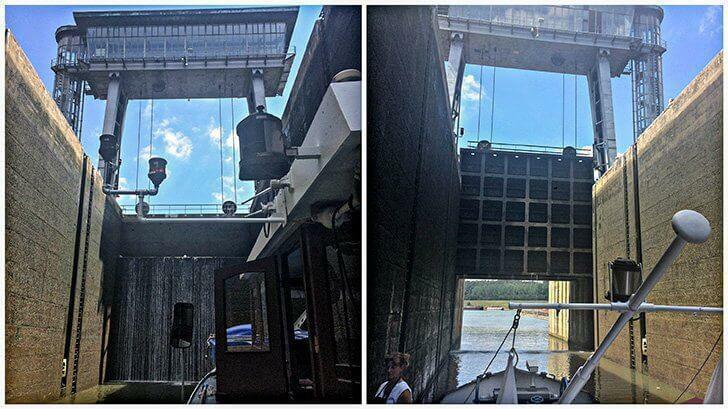 The lock is 14m deep and entering the lock at its upper level and slowly descending is quite fascinating. Ittre had a special charm, with people fishing on the banks and tourists enjoying the view of the waterway. I will definitely return someday. The last phase of our tour included the lock of Lembeek, after which the journey became less scenic. We arrived at Suikerkaai, Halle around 5 pm. We had an excellent day out discovering the many locks and boat lifts while exploring the different waterways of Belgium. Rivertours operates boat tours on other waterways too. 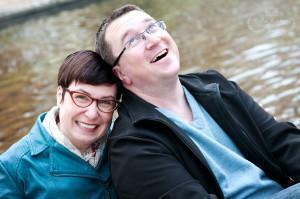 They also offer the option of renting an entire boat for a get-together or event. Enjoy the ride, discover new places, and have a barbecue, while enjoying a great time with family or friends. 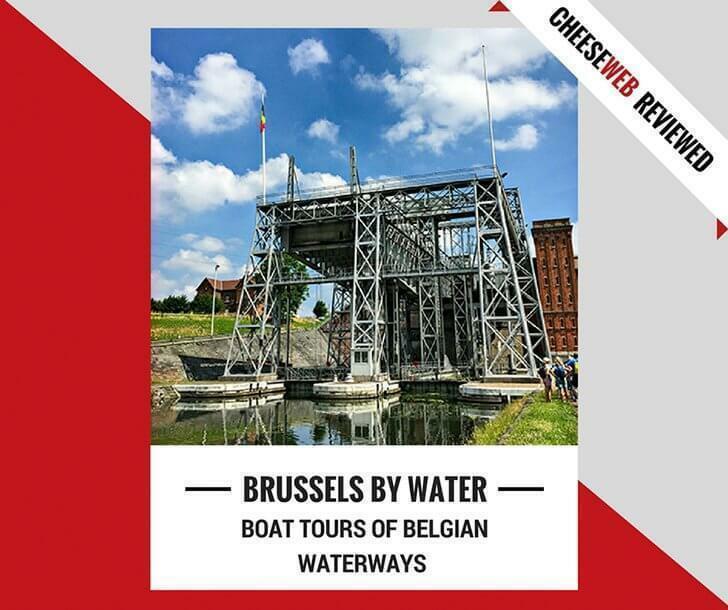 CheeseWeb would like to thank Brussels by Water and Rivertours for inviting Monika to experience their service. As always, all opinions remain those of our writers.